Will Diesel Vehicles Still be a Part of our Future? In recent times, diesel fuel technology has been occupying the news in what are (mostly) unwanted circumstances. Headlined by the Volkswagen ‘Dieselgate’ saga, which just about spread to all corners of the world, several other auto makers have also come under scrutiny over concerns they may have installed diesel emissions cheating devices. In the wake of the scandal, Volkswagen’s CEO even went as far as to say that the manufacturer would no longer be offering diesel vehicles in the US market. 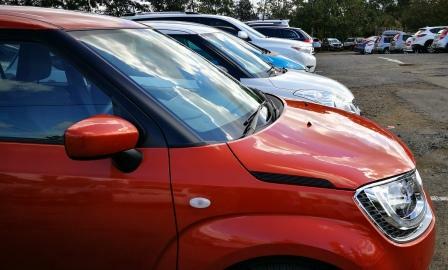 The company cited that money being spent to adhere to increasingly stricter regulations could instead be better utilised by serving future technology, such as electric vehicles. While the remarks were not necessarily aimed at the local car market, it’s not unreasonable that changes occurring in the US market would flow down under. After all, major cities in Europe, and even places like Mexico and India are already planning to take action in some form to discourage the use of diesel powered cars. One example even sees the UK mulling the idea of a trade in system for diesel cars in pollution ‘hotspots’. Meanwhile, the European Union’s industry commissioner has also suggested the phasing out of diesel vehicles could be faster than anticipated. 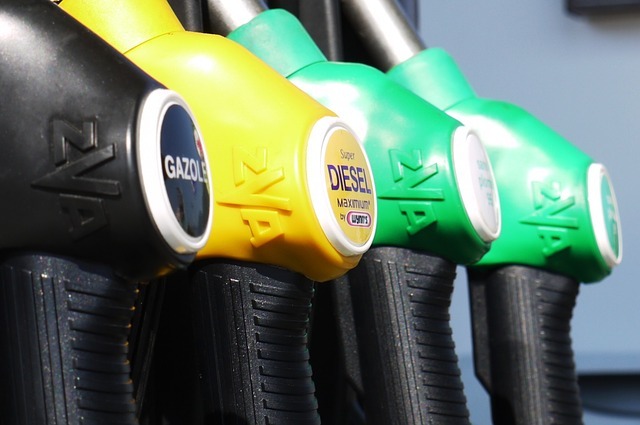 Given Australia is generally a follower when it comes to the automotive market, one has to wonder – will a change be forced upon local motorists to move away from diesel vehicles? Across the last decade, it’s estimated that the number of diesel vehicles on the road has more than doubled – today contributing one third of new car sales. As well as environmental issues, the sales growth comes despite health professionals talking about the risks associated with this type of fuel technology. Most concerning, doctors are focusing on the levels of nitrogen oxide being emitted from these vehicles, widely regarded as contributing factors to respiratory illnesses and even cancer. What’s also evident is the relative ‘strength’ in diesel car sales is being fuelled by the Australian obsession with diesel powered SUVs and utes. It’s in these categories where diesel sales have surged, despite a modest decrease in the proportion of passenger cars sold which are powered by diesel. 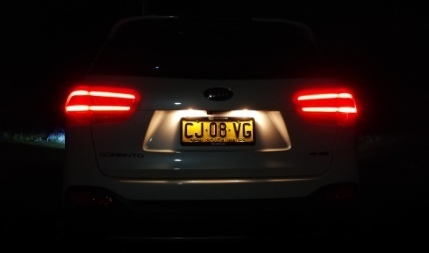 Compared with the dynamics of other markets, particularly those in compact European cities, or heavily polluted mega cities in Asia, Australia sees a far greater volume of SUVs on our roads. With a clearly established taste for larger vehicles, it seems Australian motorists will for now continue to place a greater emphasis on the prospect of a greater driving range afforded by diesel. The fuel technology, for all its health hazards, is perhaps being overlooked by authorities given the sprawling nature of our cities and lower population levels. It’s also unlikely that until such time that alternative fuel technologies like hydrogen and electricity become mainstream, and are even tailored towards our local taste for SUVs and utes, then we may have accepted our differences from the rest of the world. Let’s also not forget, the Australian government earns a sizeable chunk of money from its excise tax on diesel. Will they be taking a slice of margins once alternative fuels becomes readily available? Maybe they’ll find a way to recoup a portion – but it’s hard to imagine they have an incentive to fast-track these changes. However, if you remember back to the days of riding home-made go-karts, a basic skateboard or (I won’t tell on you) the trailer, you probably know why cars and vehicles in general are fitted with suspension systems. Without suspension, you feel all the bumps in the road. Every. Single. One. While this is great fun when you’re a kid riding in the trailer and getting bumped up and down, it’s not so much fun for longer trips and certainly doesn’t do your spine any good at all. It doesn’t do any good to anything delicate you’re transporting, such as eggs, or if you’re trying to take a blancmange or sloppy chili con carne to a potluck dinner. The full suspension system involves the wheels (pneumatic tyres), the springs, the shock absorbers and the links. Describing all of this and all of its variations would take ages and could take up several posts, so we’re going to talk about the part that does a lot of work that you might not realise: the shock absorbers. Contrary to what you might think from the name, a shock absorber doesn’t have the job of soaking up the jolting, bouncing and jouncing that comes from hitting a bump. That’s the job of the springs. What the shock absorbers do is control the harmonic oscillation. That’s a long and rather technical term for what we’re going to call the boing-oing-oing-oing factor. Although some of the springs in your vehicle’s suspension don’t look like Slinky Springs, mattress springs or trampoline springs, they are still springs and behave like any other spring. (For those interested, the weird ones we see in vehicles are usually leaf springs.) Now, when you stretch a spring then let it recoil, which is what happens when your car goes over a bump, what happens? If you can find a handy trampoline or Slinky, you can try this out for yourself. (Don’t try this on the hair of a curly-haired person unless you want to absorb the shock of a slap in the face. What’s more, hair tends to be self-damping unless its gelled like crazy.). Subject the spring to a sudden extension then let it compress by tying something to the end of the Slinky then letting it bounce out, or by letting yourself bounce down onto your bottom on the trampoline. What happens? What happens is that unless you act to stop it (technically known as damping), you get the boing-oing-oing-oing factor. After you’ve bounced down on that trampoline, you’ll get bounced back up again, or the weight on the end of the Slinky will bob up and down. The initial boing will result in lots of oing-oing-oings, with each oing getting smaller. Now, in a car, you want the initial boing as you go over a bump. What you don’t want is the oing-oing-oing, as this is downright uncomfortable as well as terrible for the handling. Vibrations aren’t good for the human body if they go on for some time (stop sniggering!). To stop the oing-oing-oing as the spring continues to vibrate after the initial shock, the vibration needs to be damped. This is the job of the shock absorbers. They’re actually dampers, which is nothing to do with that bush barbecue favourite consisting of flour and water wrapped around a stick and baked over hot coal. Shock absorbers take the kinetic energy of the oing-oing-oing and turn it into some other form, usually heat energy, via friction. 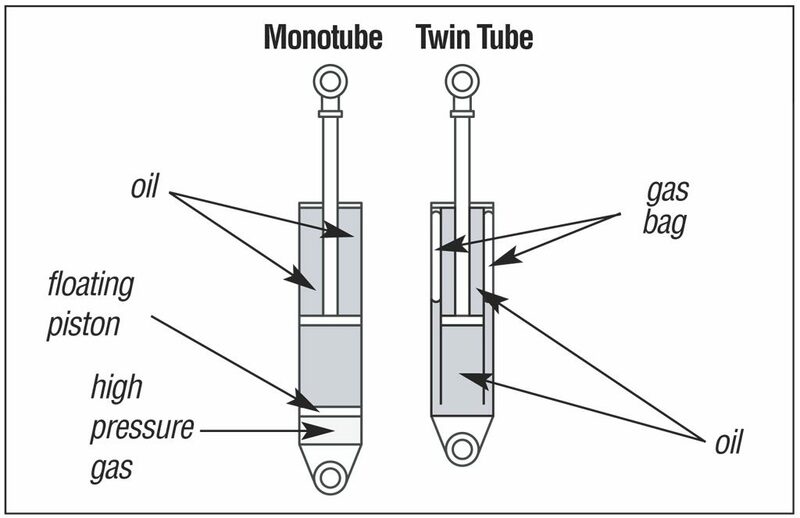 This is usually done by using the force of the oing-oing-oing to shove oil from one compartment to another through tiny holes either between an inner tube and an outer tube (the twin-tube system) or from one end of a tube to another (the monotube system). This sounds weird but it works. Think of a syringe or a cake icing gizmo. Of course, there’s a price to be paid for anything and I don’t just mean what you fork over to the mechanic every once in a while. With any system of shock absorbers and suspension, you have to trade off comfort versus handling. On the one hand, a super soft and completely damped suspension irons out all the bumps beautifully but handling is compromised – too soft and the wheels start dancing all over the place and lose grip. On the other hand, if you want the handling to be crisp and a bit of extra grip and road feel during cornering, you pay for this with extra bouncing. The stickier the liquid inside the shocks and the smaller the hole it has to go through, the stiffer it is. To use the cake icing analogy again, think of the effort it takes to push really sticky icing through a narrow nozzle for a very fine line. This takes a lot of force on your part, and if this was your damper (shock absorber), you would have super stiff, sporty suspension. Use a wider nozzle (for fancy star shapes) or make the icing runnier, and it splurts out really quickly. That’s comfort suspension. The designers of modern cars are smart enough to know that you can’t please all the people all the time, and that people are not likely to buy one car for when they want to have a smooth ride and another for when they want performance. This is why they’ve now come up with adjustable suspension systems that allow you, the driver, to pick what you want when you want it. The older systems of adjustable suspension did this by allowing you to make the holes (which are called apertures or orifices to make them sound fancy) in the damper tube big or small. Not a bad system as far as it went. These got fancier as time went by with sensors that adjusted the hole size depending on how bumpy the road was and how stiff you needed the handling. The one drawback of the hole-size-based systems is that they were comparatively slow to react to the situation. After all, the signal had to get from the road to the sensor to the apertures, which then had to move from A to B. The designers decided it would be much quicker and better for handling and comfort combined if you could somehow make the liquid inside the shocks thinner or thicker depending on what you want. Although heating would make the liquid thinner (it does this anyway), this would be even slower and cooling for a stiffer suspension would take longer still. And that’s exactly what happens in a magnetic shock absorber. If you remember your high school physics, which is probably where you got to play with magnets and iron filings, you may recall that any suitable iron rod wrapped with enough twists of copper wire becomes a magnet when current goes through the wires. The more current, the stronger the magnetic field. Now, how quickly does it take electrical impulses to go from A to B? Hardly any time at all. This means that an active magnetic suspension system will detect what’s going on with the road surface, the speed, how fast and hard you’re cornering and all those other factors that contribute to handling, and will increase or reduce the current going through the coils in a magnetic shock system almost instantaneously. This means that the fluid in the shocks becomes hard or soft as needed. Designs for magnetic dampers are being worked on all over the globe and should be able to move from more luxury vehicles (such as the Cadillacs and Ferraris that had it early on in the picture) to common everyday vehicles. The boffins will have to work out how the increased energy needs will work in electrical vehicles, but regenerative braking and harvesting the energy absorbed by the shocks themselves will go some way towards this. The response speed isn’t the only advantage that the new magnetic systems have over the hole-based ones. Wires don’t wear out as quickly, whereas moving parts do, as we all know. Speaking of moving parts wearing out, you can use the boing-oing-oing-oing factor as a test when you are checking out a second-hand car. 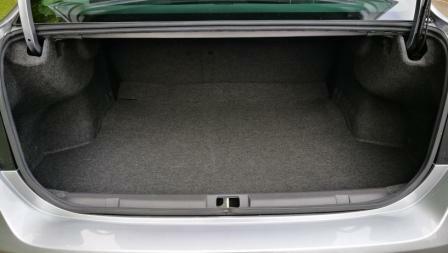 Shove down as hard as you can on the back end without denting the boot. If you get an oing-oing-oing after your initial boing, the shocks are shot. Walk away and look at another vehicle – or start having a chat to the team here at Private Fleet – if you want to avoid the mechanic with the sucked in cheeks and the shaking head. 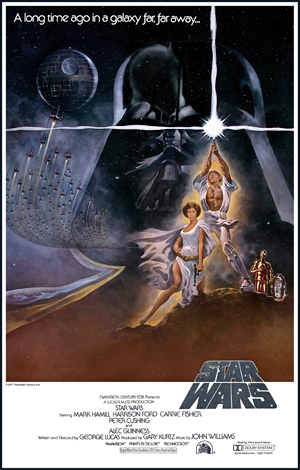 In May of 1977 a film was released, a film intended to be an homage to the serials of the 1940s one might watch at the local flicks on a Saturday. With a nod towards westerns and featuring a cast of mostly unknown actors, Star Wars hit an unsuspecting public smack between the eyes. 2017 sees the fortieth anniversary of that film and Private Fleet takes a look at a few of the cars that turn forty also. Yes, a bit of nothing more than a new grille differentiated the HZ Kingswood from the previous model visually, but it was underneath, with the introduction of RTS or Radial Tuned Suspension , that made this an important car for the then flourishing Aussie market. 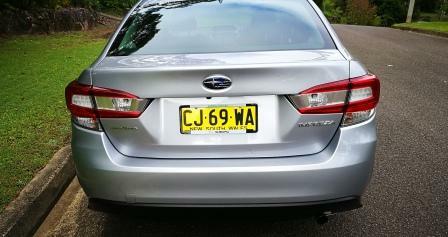 It was also the last large sedan Holden would make for some time. “It’s a sensation” went the advertising for a car that was built by Chrysler Australia and was based on the same car made by Mitsubishi. 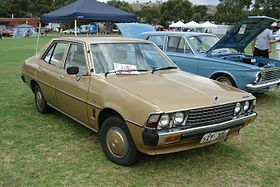 Powered (stop snickering) b,y at the entry level, 1.6L carbied four cylinder that was good for 56 kilowatts and 117 torques, the GE series Sigma became a mainstay of the Aussie market for a few years and kept the Sigma name plate when Mitsubishi took over the Chrysler manufacturing. There was even a Sports pack for the 2.0L version, with striping, low fuel warning light, sports tiller, and steel belted radials. Ford LTD 2. Although a nameplate once familiar to Aussies, this was the American version and was, oddly, classified as an intermediate sized car. Given it was bigger than the German battleship Tirpitz and was powered by a strictly V8 engined lineup putting power down via a three speed auto, it’s hard to believe that a five point five metre machine could be considered an “intermediate” sized car. 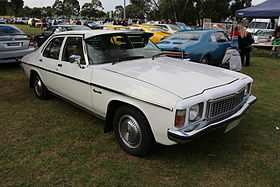 It was available in three trim levels including the top of the range Brougham, a name familiar to Australia Holden fans as the predecessor to the Statesman. Volvo 262C. The squared off, boxy, blocky Volvo designs of the 1970s gained some coolness with this car from Swedish manufacturer, Volvo. Built in Italy and powered by a 2.6 litre V6 engine, this two door beauty still looks as gorgeous as the day it first appeared in 1977. Italian design house Bertone was responsible for both the design and build, with the coupe’s roof ten centimetres lower than the donor car, the Volvo 260. Standard equipment included power windows and mirrors, central locking, full leather interior, power mirrors, cruise control, air conditioning, heated front seats, alloy wheels and electrically powered radio antenna. Triumph TR7 Sprint. British maker Triumph, along with MG, made some of the most memorable two door cars of the sixties and seventies but not always memorable for the right reasons. At least this one went some way towards a good purpose, being a limited run of 62 cars to homologate the Group 4 Triumph 7 rally car for the 1978 season. The engine was a two litre, 16 valve, single overhead camshaft type and bolted to a five speed manual. 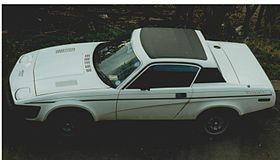 Peak power was 127 bhp, more than the same capacity slant four version found in the standard TR7. Aston Martin V8 Vantage. Broad shouldered, hairy chested, metaphorically wearing a thick gold chain, Aston Martin’s V8 Vantage packed a 5.3L V8 with 280 kilowatts which promised a top speed of 280 kilometres per hour. 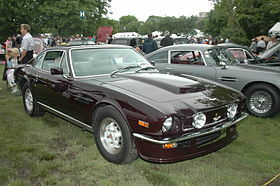 Sharing the basic engine package with the Lagonda at the time, the Vantage received re-rated camshafts, a higher compression ratio, bigger valves and carbies, all which lead to a 0-60 mph time of a still rapid 5.3 seconds, quicker than Ferrari’s Daytona. So where ever you are you the galaxy as you celebrate forty hears of these cars and forty years of Star Wars, May The Force Be With You. 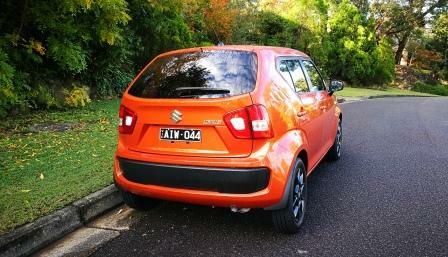 2017 Suzuki Ignis GLX: A Private Fleet Car Review. The small car company has gone back to the future with a re-release of an old nameplate. Let’s welcome the 2017 Suzuki Ignis GLX. 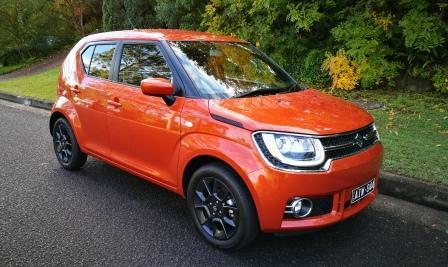 When I say the small car company, I mean in the sense of the size of the cars; the Ignis is a tiny 3.7 metres in overall length, stands just 1595 mm tall ( a bit higher than the donor chassis Swift) and is just 1660 mm wide yet never feels cramped inside. For four people, that is. Somehow, they’ve managed to cram in a wheelbase of 2435 mm which provides plenty of leg room up front and an adequate amount for adults in the rear. It’s a blocky, squared off, design bar the leading edge of the roof and windscreen bracketed by the A pillars donated from the Swift. 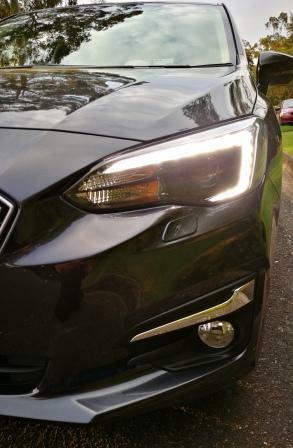 The driving lights as they wrap around the lower section of the headlights offer a cheeky grin and there’s a spot of LED at the rear. There’s a sharp angled, triangular, panel section in the C pillar and rear door, above the rear wheels with three indentations to break up that area visually. There’s a hint of Renault in the rear wheel arch, with a reminder of the pertness the French design into their hot hatches. Inside the test car is a mix of light and shade. There’s black plastic throughout most of the cabin bar white inserts in the door and dash and colour coded centre console and door grabs. The rear seats it higher than the front and for an unsuspecting adult, it’s all too easy to see the side of the head hit the door entry at the top. The charcoal and dark grey seats are comfortable enough if lacking in side support. The trim itself is an eclectic mix, with a carbon fibre look to the outermost airvent covers, piano black in the console, the bone white contrasting with the almost matt black in the rest of the cabin. The GLX comes with a four quarter touch screen mounted top front and centre. It splits up into audio, phone, guidance, and smartphone connection for allowance to Apple CarPlay and Android Auto. Easy to use? Yes indeedy. Leather wrapped tiller? Natch. Voice command and Bluetooth? Of course. 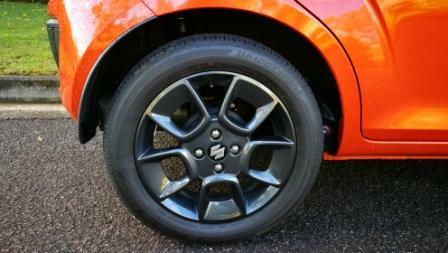 The Ignis is motorvated by Suzuki’s 1.2L TwinJet four cylinder. There’s a CVT, Constant Variable Transmission, on board, which takes full advantage of the 120 torques at 4400 rpm and 66 kilowatts 1600 rpm further up the range. There’s a disconcerting hesitancy off the line before the CVT bites, a hesitancy enough that a double check for oncoming traffic is needed. It’s old school CVT in that it’ll rise in revs before plateauing even as speed increases before backing off and seeing freeway speeds at around 2000-2200 rpm. The CVT is also fitted with a low gear ratio, which, in certain circumstances such as climbing or descending hill roads, helps greatly in acceleration and engine braking.It’s an economical little beast, with a worst figure of 5.7L per 100 kilometres to move the 820 kilo machine. Economy as quoted by Suzuki for the combined cycle is 4.9L per 100 kilometres and you’ll need an economical package give the thinble sized fuel tank of just 32 Litres. 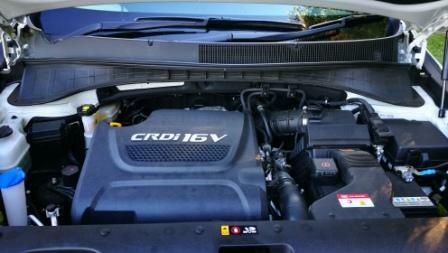 It’s a surprisingly quiet engine and transmission combo too, with little of the expected thrashing and rattling. What was also unexpected was the ride and handling. Considering the tube sock tyres wrapping the black painted alloys, at 175/60/16 in overall size for the GLX, there was little tramlining, little unsavoury movement on rutted and dishevelled roads, and little sideways movement in crossbreeze. The coil sprung suspension combo of struts and torsion beam hold disc and drum brakes, and makes for a suprisingly well sorted ride. There’s a bit of road noise on rougher tarmac however the ride itself is supple enough. In fact, the only time the suspension made itself known was on the longer duration undulations and shorter dips, where the rear would compress quickly and the bumpstops would say hello. The two model range, GL and GLX, starts with a driveaway price just shy of $17000. The GLX is just two thousand more and one can option a black roof for $1000 and naturally there’s pricing for the predominantly metallic paint range. Suzuki will throw in their standard three year or one hundred thousand kilometre warranty, capped priced serving over the six monthly intervals with a maximum of $300 at the 60 month mark. 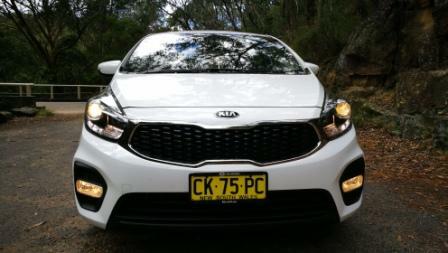 SUVs are the big ticket seller in Australia and one of the brands that nails this market is Kia. The Sorento is their big gun here, and quite bluntly, the 2017 Kia Sorento GT-Line is an absolute pearler. 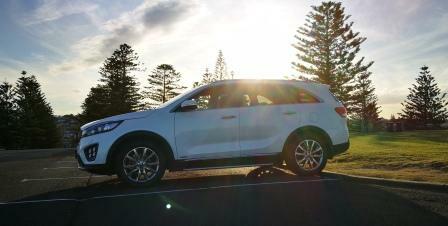 Here’s why the $58490 (plus on roads) Sorento looks like a winner. It’s a seemingly tiny 2.2L diesel up front of the two tonne beast. Seemingly, until you find out there’s 441 torques on tap at a very useable 1750 to 2750 rpm range. Economy around town is quoted as 10.1L per 100 kilometres. Combined is 7.8L/100 km. Private Fleet had slightly more urban than highway usage yet managed to finish on a highly credible 8.5L/100 km, from a 71L tank. 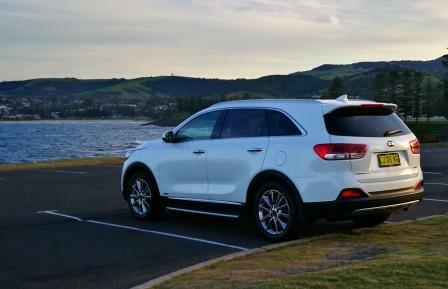 In fact, the Sorento had just ticked over to 750 km as we rolled into a station to top up and still had an expected range of sixty kilometres. There’s a surprising amount of peak power, 147 kW, at 3800 rpm, meaning the transition between peak torque and power is a smooth and natural transition. Acceleration is, as a certain British brand would say, adequate. What isn’t are the brakes. For such a heavy and quick vehicle the brakes need more bite initally, as there’s just too much travel before anything feels like it’s about to bite. 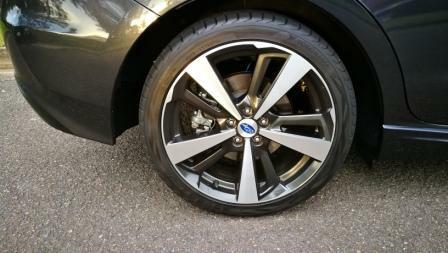 It’s a niggle, given the size of the front and rear discs at 320 mm and 305 mm respectively. That’s about it for anything not quite right. The rest of the GT-Line Sorento is as good as you’re going to get in the market right now. 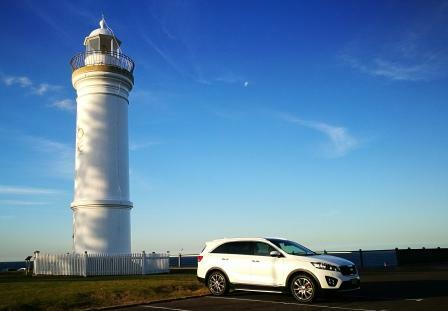 Standard equipment is pretty solid on the Sorento Platinum, on which the GT-Line is built upon. Naturally there’s a slick six speed auto and an all whheel drive system that’s front drive oriented until sensors divert grunt rearwards. 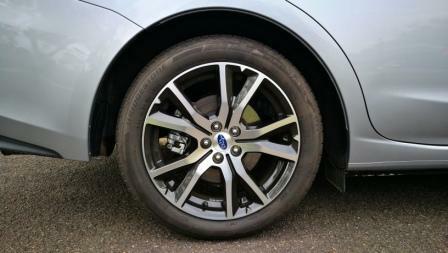 The 19 inch alloys are chromed and look stunning, wrapping 235/55 rubber. You’ll enjoy tyre pressure monitoring and a full sized spare, for that extra peace of mind. There’s an electrochromic rear vison mirror, which means it automatically dims any headlights and immediately minimises any potentially dazzle. 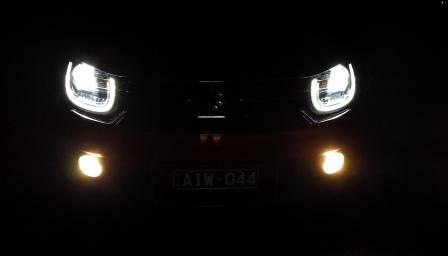 On board are auto headlights, of High Intensity Discharge configuration and are auto leveling to boot. Kia also fits the Platinum and GT-Line with AFLS, or Adaptive Front Lighting System which “controls the headlight beam and adjusts it to suit the steering angle.” The mocha coloured leather seats are heated AND cooled with the driver getting a ten position adjustment and memory positioning, the gloss black and leather trimmed steering wheel is heated and yes, it does make a difference. 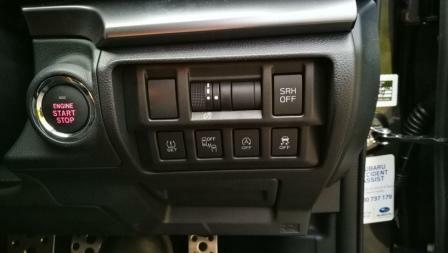 A nifty touch to the front seats is the switch mounted high up on the passenger seat’s right hand side, which allows fore and aft adjustment & backrest tilt by the driver for any middle row passenger on that side feeling a touch cramped, not that they should with the leg room available. The driver gets a seven inch information screen and there’s a seven inch touchscreen for the Infinity ten speaker audio system, of which the junior reporters for Private Fleet said was the best car audio system they’ve heard. 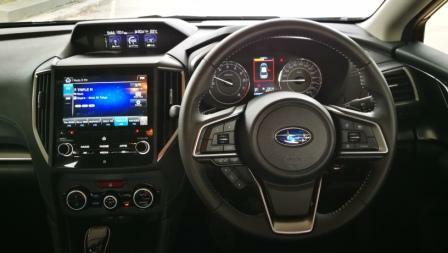 Naturally there’s satnav on board, which was easy to use and is designed with a clean to read look. 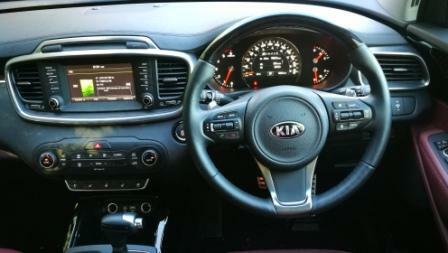 The dash design is classic Kia, with ergonomics taking pride of place. Buttons and dials are where instinct would have your hands fall, the textures of the various plastics range from a leather look to gloss black, and there’s even extendable sunshades which, on the drive south to the beautiful NSW coastal town of Kiama, were a boon given the setting sun on the driver’s side of travel. Passenger comfort and amenities aren’t forgotten either, with 2 USB ports, three 12V charging ports, six cup holders, four bottle holders, map pockets, and rear seat aircon, plus a full glass roof for night time star gazing. Inside the 4780 mm long machine lies a wheelbase of 2780 mm. 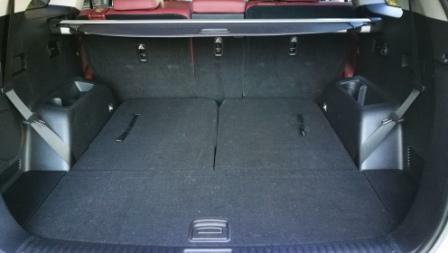 Inside that is a seven seater configuration, allowing luggage space to go from 320 litres to a huge 2066 litres. 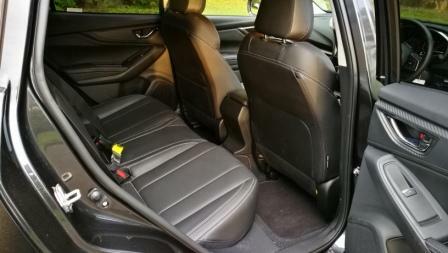 As usual, Kia’s engineering is tending towards functional easiness, with a simple and highly effective pull strap system being used to raise and lower the third row seats. 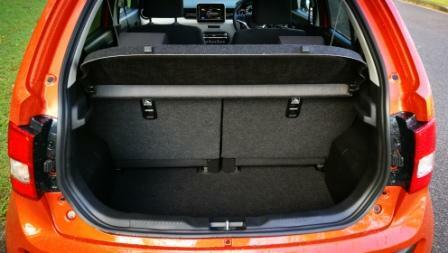 For privacy and secuity, Kia also add in a cargo screen, net, and offer an under floor compartment. Outside, the GT-Line gets alloy sidesteps and red brake callipers, which contrasted nicely with the test vehicle’s Snow White Pearl and the aforementioned chromed alloys. There’s folding mirrors, external lighting including in the door handle area, and the car responds to you as you approach thanks to the key fob triggering those mirrors and lights. And you’ll not be disappointed in the Sorento’s mix of assertiveness and flowing lines. There’s the quad or “Ice Cube” LED driving lights as seen in the sadly missed pro_ceed GT, the standout “neon light” look for the rear lights, and the trapezezoidal look for the windows in profile. 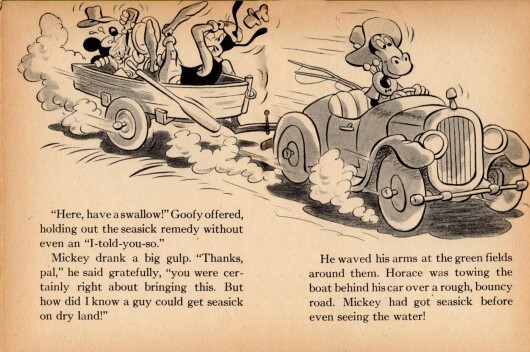 It’s the road manners of the big car that will prove to be the crucial part of the experience. It’s adpet and dealing with road surface changes, nimble when required, sure footed and planted over almost everything, flattens those annoying shopping centre speed bumps into submission, and then there’s driveability from that torquey four for the extra dial it up factor. 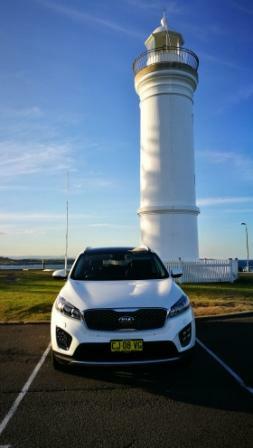 As mentioned, A Wheel Thing took the Sorento to Kiama, south of Wollongong, and chose to use the tight and twisty Mount Keira Rd and Harry Graham Drive, along the top of the imposing escarpment overlooking the town. They’re great roads for testing the handling mettle of cars and proved ideal in testing the two thousand kilo plus car. Brake travel feel aside, when they bite they do an excellent job on hauling the Sorento down to sharp corner speed, especially on some of the steeper turns. The three mode steering system adds a bit more heft in Sport but still remains somewhat artificial in feedback and is best left in Normal. 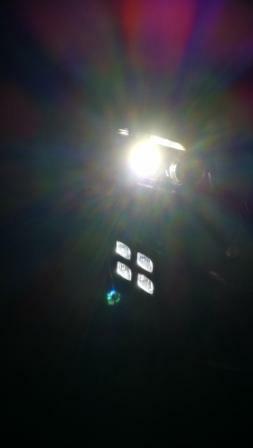 It’s deft enough in that mode with quick response to light movement. Plus, the suspension on the Sorento is such that weight transfer, anything that may unsettle the vehicle in such a situation, is balanced nicely between comfort and control. Naturally there’s the usual safety features although there’s no driver’s kneebag. There’s Blind Spot Detection, Lane Change Assist, Lane Departure Warning System, and Autonomous Emergency Brake with Kia’s Forward Collision Warning System. 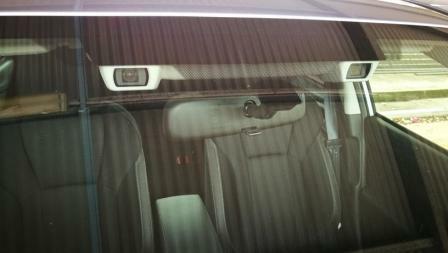 Two ISOFIX child seat mounts are standard across the range as are seatbelt pretensioners at the front. There really is very, very, little to find fault with in the 2017 Kia Sorento GT-Line. 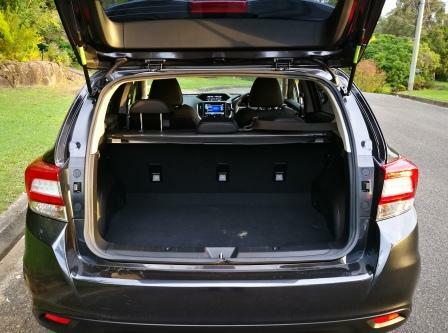 In honesty, the brake feedbake and lack of driver’s kneebag are all that really could be improved and added, as the rest of the package for the Sorento GT Line is near nigh perfect. Add in the now standard seven year/150000 kilometre warranty, roadside assist and capped price servicing and it’s a bundle that has nothing left to be added in. It’s a car that’s better than well placed to take on the Europeans and beat them at their own game. In one of our recent posts, we covered the benefits that come with inspecting a second hand vehicle. We also briefly touched on one other vital consideration when it comes to used cars. That is, ensuring the vehicle hasn’t previously been written off. Not only do you want to avoid the prospect of ending up with a lemon, but the ramifications could be a LOT worse – both in terms of safety, and from a financial perspective. The good news? Each state and territory has made this easier for motorists by hosting their own register online. When it comes to write-offs, it’s important to distinguish that there are two types – statutory write-offs, and repairable write-offs. Both categories on the register are restricted to vehicles up to 15 years old. The registration of a written off vehicle is also cancelled once declared a write-off by the relevant authority who supplies the information. Such authorities typically include the likes of insurance companies, dealers, auctioneers, and other parties who trade such vehicles for parts or scrap value. 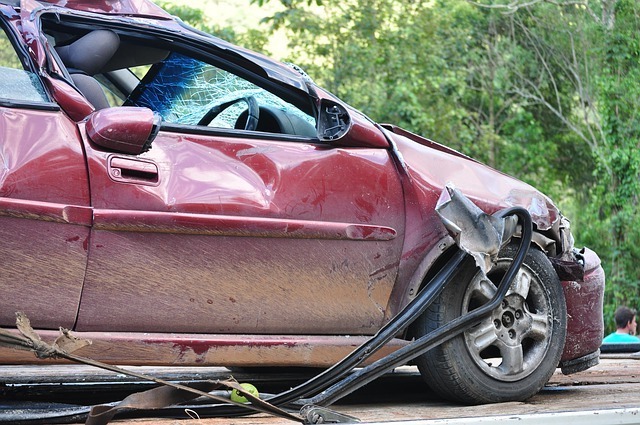 In the case of a statutory write-off, the vehicle has either been: damaged beyond economical repair; damaged extensively by hail, floods or fire; stripped of parts; or suffering a notable level of structural damage that would inhibit the vehicle being repaired to a safe and operable standard. These vehicles are meant to display a notice advising of their written off status. Meanwhile, it is prohibited to repair the vehicle or take it onto the roads – its use is now limited to scrapping, or for parts. As far as repairable write-offs, these vehicles are deemed as a write-off when their underlying salvage valuation plus costs associated with repairing any damage exceed the market valuation of the vehicle. This has a tendency to work against older vehicles, particularly those from luxury manufacturers, or models which are known to depreciate rapidly. Unlike a statutory write-off, vehicles which have been declared a repairable write-off may be repaired and returned to the road. This will typically be recorded with the registration body in each state, and may show up on the registration certificate. As you can image, the process of returning a vehicle of this nature onto the road is somewhat strict. As well as the repairs themselves, owners are required to provide relevant documentation proving the identity of the car, while also taking the vehicle through a roadworthy test and government inspection. Having the peace of mind and clarification that a vehicle is a statutory write-off is a blessing for motorists. 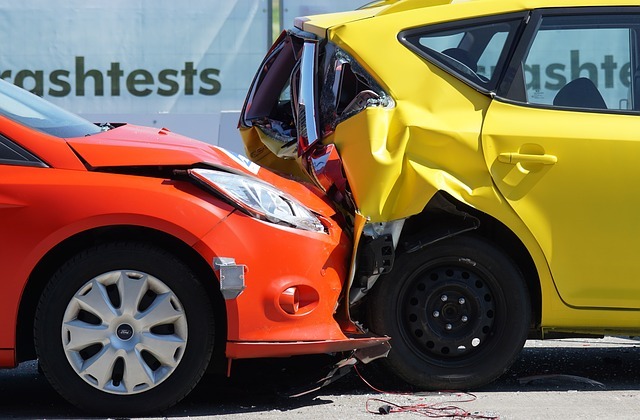 On the contrary however, the presence of repairable write-offs on the relevant registers means that affected vehicles will take a significant hit in terms of their valuation – despite the fact they have passed all necessary tests and are considered safe and operable. Keep this in mind if you’re considering purchasing a vehicle that was a repairable write-off. 2017 Kia Rondo S: A Private Fleet Car Review. Once upon a time, before the rise of the SUV machine, there were people movers. This particular kind of vehicle has, more or less, disappeared off of the face of the motoring world, however Kia continues to burn the flame with their excellent Carnival and the criminally underrated Rondo. 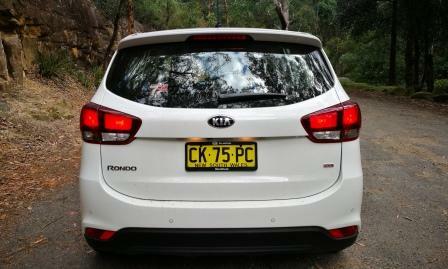 It’s the latter that a rewarding week was spent with and Private Fleet comes away musing why the Kia Rondo S isn’t in more driveways. Up front, literally and metaphorically, there’s an issue, and one that may be part of the Rondo’s near invisibility. 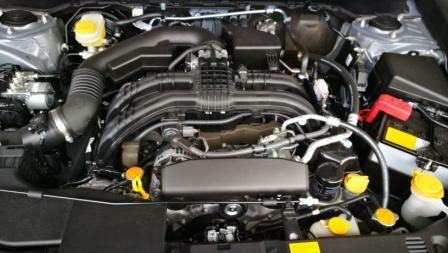 There’s just one engine choice and that’s a two litre petrol engine. Peak oomph is 122 kW and peak twist is just 213 torques, at 4700 rpm. It’s a people mover, but there’s no torque. There’s no torque because there’s no diesel. Here, right here, is the arrow in the heel for the Rondo. 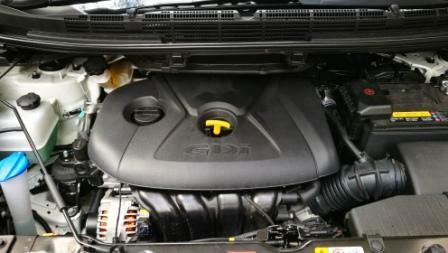 The Carnival has a stupidly thirsty petrol V6 or a frugal and more sensible diesel. The Rondo needs, badly, a diesel engine with the torque to do what a people mover does. Why? 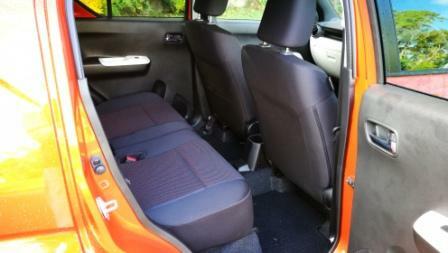 The Rondo starts with 1520 kilos in five seater form, and 1546 kg for a seven seater. Lob in people (it is a people mover, remember) and let’s say 4 x 100 kilos. Straight up there’s a two tonne mass. Diesel. Please. There’s a further anchor, unfortunately. The Rondo lacks real feedback from the opposite of go. The brake pedal just seems to lack bite and feedback to the driver via the 300 mm and 284 mm discs. There’s a press and…nada…press harder and THEN there’s something. Given the role the Rondo has, it needs a better communication between foot and brake. 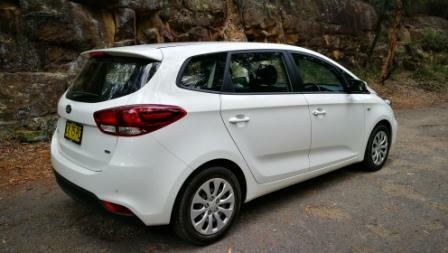 Back to the front: Kia quote 10.8L/100 km in the urban cycle. That’s using standard unleaded and from a 58L tank. Given that the urban jungle is the natural environment in which the Rondo will prowl, a sub six hundred kilometre range isn’t up to par. 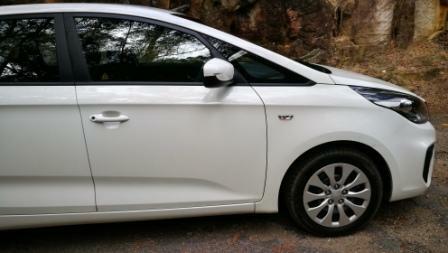 However, if doing country commuting, that figure drops to a quoted 6.2L/100 km. Ride quality in the S is good, not great. It’s a touch too soft at the torsion beam rear, squishy at the MacPherson strut front with a twenty kph roll over a school sized speed hump having the suspension crash out on the far side, and feels as if it bottoms out just a little too easily. That’s with just the driver on board. There’s a need for a more Aussie tuned suspension, with higher spec variable rate suspension that will dial out the softness and not bring an excessively sporty feel to the car. However, it’s a good handler, with mild understeer from the 205/55/16 rubber when pressed, otherwise it’s pretty neutral and responds, for the most part, quite well to steering wheel input. 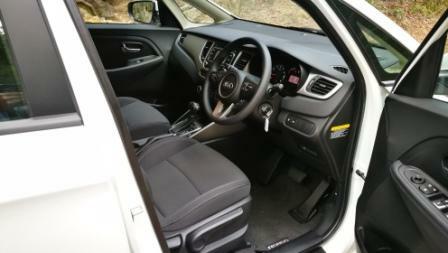 Kia stay with the three mode steering option and it’s best left in Normal. 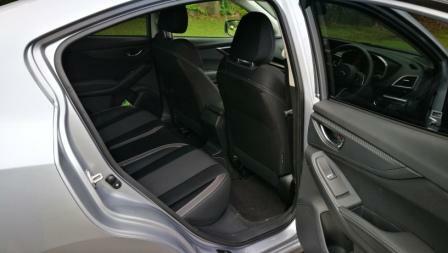 There’s plenty to like inside the near $27K (RRP) Rondo S, with a tidy and ergonomic interior. 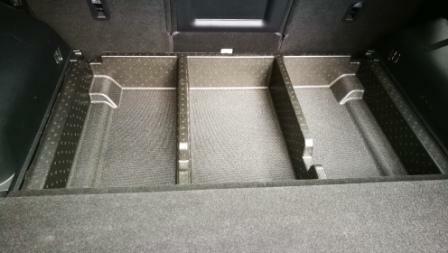 There’s the 35:30:35 split fold rear seats, 536L of cargo in the five seater which increases to a massive 1694 litres with the seats folded, plus a hidden storage section under the cargo floor. 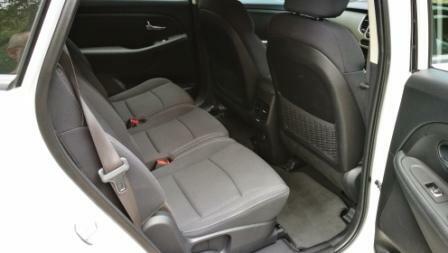 The grey trimmed seats are comfortable enough, with good lateral support in the front. 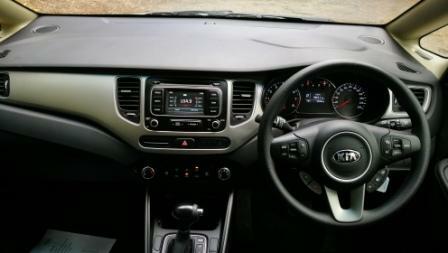 The dash itself is typical Kia with a clean & simple look, a smallish (4.3 inches) info screen in the centre dash, a pleasing contrast in plastics in both colour (a satin silver garnish on the dash) and feel, and decent audio quality but the tuner lacked sensitivity for FM in some areas. There’s also dusk sensing headlights, reverse sensors and camera, Hill Start Assist, and a full suite of active & passive safety features including six airbags. Being a people mover oriented vehicle, Kia have loaded the Rondo S up with four 12V sockets, five cup holders, and four bottle holders. There’s map pockets for both front and rear doors, even a second row fold out “table” that’s mounted in the centre seat back. There’s plenty of breathing space inside the 4525 mm long car, with a wheelbase of 2750 mm endowing the Rondo with enough elbow, leg, and hip space for most people. It’s not an unattractive car, the Rondo. There’s a longish pedestrian friendly bonnet, considering the overall length, which slopes into a steepish windscreen. This, though, gives a huge amount of frontal crash protection, with front passengers seemingly located halfway along the Rondo’s overall length. 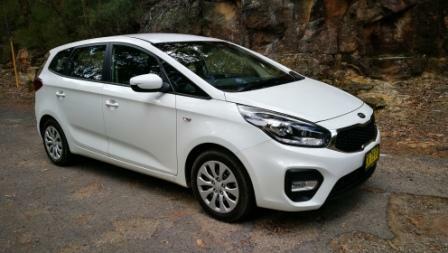 There’s a resemblance more to the Picanto than any other of the Kia range, with bulbous headlights sitting above the driving lights whilst the rear is clean, if not overly eyecatching. Warranty is Kia’s industry leading seven year coverage, with a rolling service cost over the seven years, with the first twelve months or fifteen thousand kilometre at $299. Over the seven years, you should be looking at a cost of just under $2600. Artist’s impression of the Skydrive. Image courtesy of Cartivator. 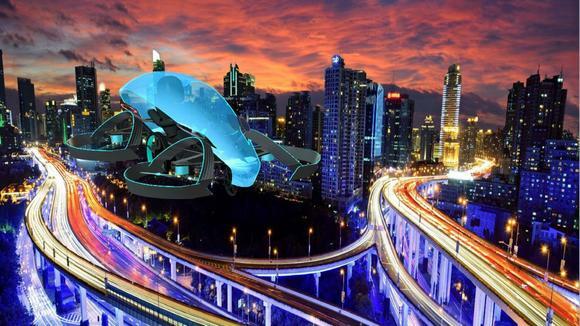 “Where are all the flying cars?” Those who are either old enough to remember the old movies or retro buffs raise this question from time to time when they look at the technology of the early 21st century (i.e. now). The rest of us shrug our shoulders and may have the attitude that smartphones and the internet – something barely imagined by the majority of sci-fi writers of the 1950s–1970s* – are a fair substitute. 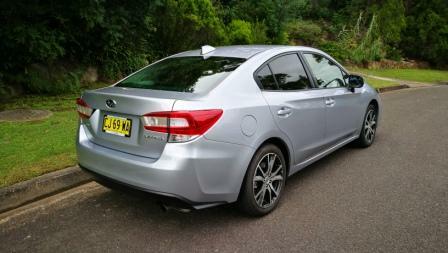 2017 Subaru Impreza Sedan and Hatch: A Private Fleet Car Comparison. It’s called “the trickle down effect”, where technology and design filter through from the top to the entry level models. 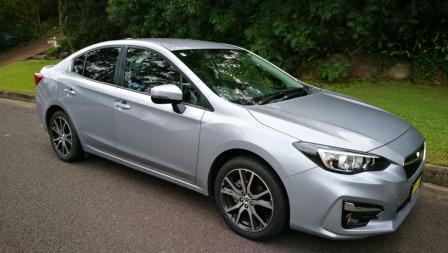 Such is the case with the slightly reskinned and revamped 2017 Subaru Impreza sedan and hatch, in L and S specification. 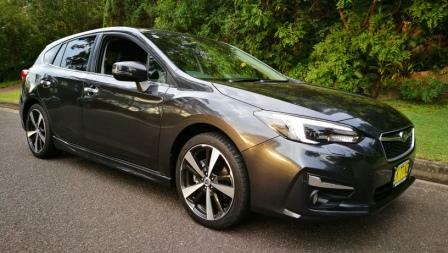 It’s been pretty simple for Subaru; refine, improve, sell. And it’s worked, with the 2017 Subaru Impreza copping mild but noticeable sheetmetal changes, interior and specification upgrades, and subsequent exposure on road. For example, their hatch looks different to the sedan. No, not because one has four doors and the other five, there’s different approaches to the rear doors, with a taller look to the fixed window in the hatch. The fuel filler lid is closer to the tail lights in the hatch and the hatch had plastic inserts in the front bumper for what overseas markets get, washers for the headlamps. All of this in a length of 4625 mm in the sedan, 4460 mm for the hatch. Even height is slightly different, with the hatch 25 mm taller than the sedan. It’s also a smoother and somehow better looker than the previous version. 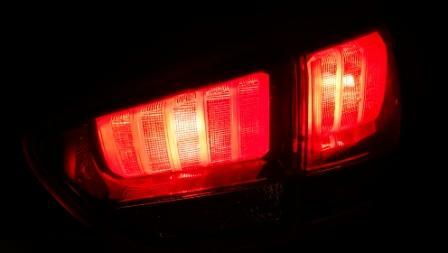 There’s a redesign to the rear light cluster that tidies things up and at the front it’s…just better. Smoother, cleaner, less fussy, definitely easier on the eye. C shaped LEDs bracket (and mirror the tail lights) a chrome strip in the grille and sit nicely above halogen globe driving lights. 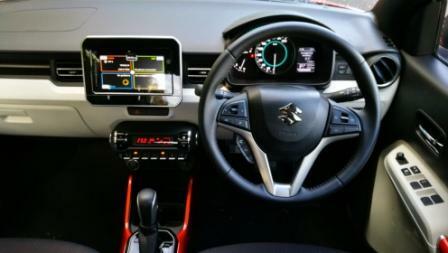 Inside, it’s subtly different from the previous model, with a different look to the screens located in the centre and upper dash. 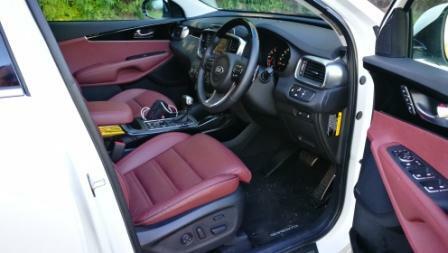 Information for the upper section has been reformatted and is still accessible via the steering wheel’s buttons. The eight inch touchscreen is cleaner in layout, making it more driver (and passenger) friendly, and both Apple CarPlay and Android Auto are on board. The hatch in S spec has an array of buttons just above the driver’s right knee, which includes tyre pressure adjustment, blind spot warning, and SRH or Steering Responsive Headlights. 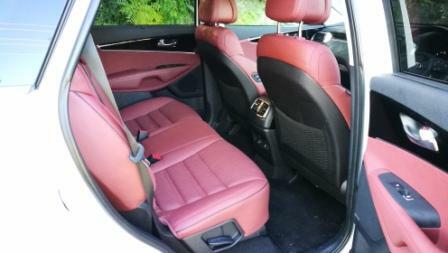 The L sedan received charcoal and grey cloth pews, with the S spec running up to leather and heated (only, no ventilation, a must for the Aussie market) seats, with both test cars being given black and ivory trim. 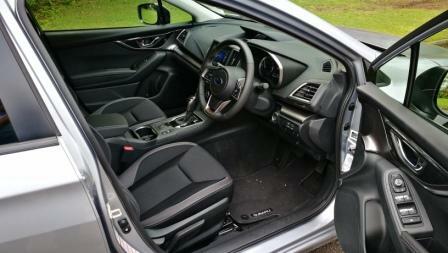 The S also gets rain sensing wipers, 8 way power seats, and satnav over the L specification, plus a glass roof. 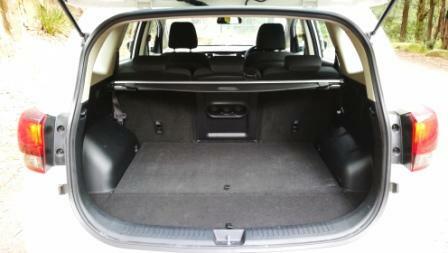 The sedan also gets a reasonable 460L boot, with the hatch starting at 345L before looking at 790L with seats down. All variants receive the 2.0L flat four, with 115 kilowatts @ 6000 rpm, and 196 torques @ 4000 rpm. Transmission options are simple. There aren’t any. 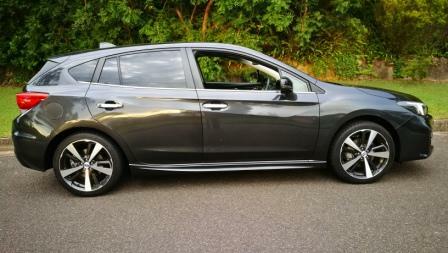 You’ll get a CVT with seven programmed ratios and you’d be forgiven for wondering if that’s a good thing. The simple answer is yes. 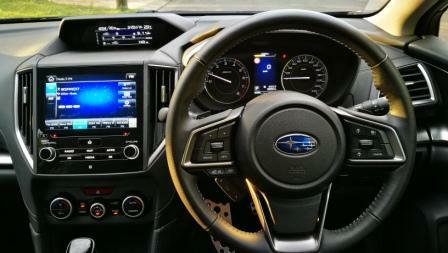 Subaru’s CVT setup works best with light to medium throttle from a standstill, as there’s instant grab from the system. A heavy right foot really makes no difference until you’re under way. It’s here the pair come alive, with that all paw footing and the CVT’s linear delivery of torque really combine to imbue a genuine sense of that technical word “oomph”. Brakes work efficiently too, with almost just the right amount of travel before bite and a lovely, well modulated, feel as you increae pressure which doesn’t leave the driver wondering if they’ll pull up in time. The S also picks up Active Torque Vectoring, which Subaru says: Subaru Active Torque Vectoring (ATV) applies light brake pressure to the inside front wheel as your Subaru car carves a corner, which pushes more power to the outside front wheel, reducing wheel spin and sharpening handling. It’s unnoticeable until you think about what it’s doing when you pile into corners and curves. It’s then that the handling aspect of the S shakes your hand and introduces itself to you. But by no measure does the L spec feel underprepared, as it rides just as nicely, with perhaps a touch more tautness across the yumps, lumps, and bumps found around Sydney’s highways and freeways. There’s the same rolling diameter to help, with the S getting Yokohama rubber at 225/40/18 whilst the rest of the field go down a size wheel wise, and up a size tyre wise, at 205/50/17 from Bridgestone. You’ll find that you’ll get good economy along the way, with Subaru quoting 7.2L per 100 kilometres on the combined cycle. Punch it around town, though, and potentially you’ll see north of 9.0L per 100 kilometres. That’s on the specified 91 RON from a smallish fifty litre tank. Safety is ANCAP rated five stars, with front, curtain, side and knee airbags, along with ISOFIX child seat mouts, seat belt height ajusters for driver and passenger, and Subaru’s “Ring” safety cell. You’ll also receive the three year/unlimited kilometre warranty, three year capped price servicing, and twelve months roadside assistance. Subaru really don’t seem to be doing anything wrong at the moment. 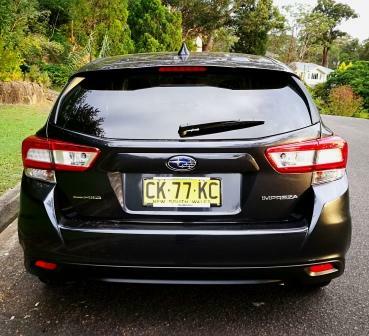 The Outback and Forester range are selling well, the BRZ is doing fine and the Liberty sedans seem to be more prevalent on the roads. 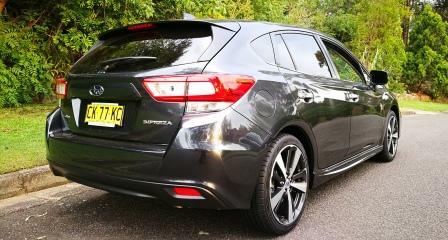 There’s a new XV on the way and in between them all is the mainstay, the Impreza. Both sedan and hatch, in 2017 guise, have raised the small to mid sized sedan and hatch bar even further. Under withering fire from the Focus, i30, Cerato, Astra and the perennial Corolla, the “other” Japanese car company continues to win hearts and adherents to the star flagged brand. If the scratch is this bad, it’s probably best to take it to a professional. #$%^&*()$%^&*!!!!!!! You left your car in the supermarket carpark looking perfect with nicely polished paintwork, and when you got back, you found that some clown opened their door and nicked the paintwork. Or the dog was just so pleased to see you and jumped up trying to lick your face through the car window with scrabbling paws and left marks of their affection all over the panelwork. Or (worst case scratching scenario) some pillock (and that’s using mild language) decided it would be funny or appropriate to key your car and leave marks all down the side. It doesn’t matter how the scratch got there, whether you missed the keyhole with the key or whether your toddler rode a tricycle too close to the car in the driveway: it’s got to be fixed. 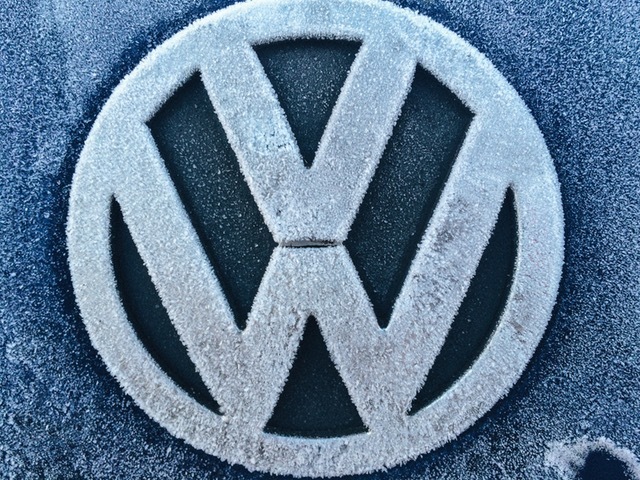 And yes, despite what dodgy used car sales people will tell you, even a teeny weeny little scratch does matter. It lowers the value of your car and it makes your car’s paintwork look ugly. What’s more, not bothering and not caring about the scratch can lead to a general attitude of neglect and can’t-be-stuffedness about car maintenance, which can lead to you eventually not bothering about or putting off essential maintenance tasks like topping up the fluids and checking the oil. Most importantly, scratches allow water, chemicals, grit and dirt to get to the metal beneath the paintwork. This means that the metal is going to corrode more quickly, and we all know how once rust starts, it doesn’t stop easily without a lot of hard work, either by you or your local friendly mechanic. Small scratches, if they’re not associated with dents, are easy enough to fix at home with equipment you may already have or that is easily picked up at your nearest automotive supply shop. First of all, clean the area on and around the scratch. There’s no point sealing grit and dirt under new paint. Next, assess how deep the scratch is. If it hasn’t gone all the way through the paint or it has only gone through the top layer, it will take a lot less effort to fix. Did you know that car paint involves four layers? Lightly run the tip of your fingernail across the surface (making sure you don’t scratch the paintwork any further). If the tip of your nail snags a little bit in the scratch, you’ve got a deeper one to deal with. If you can’t feel it, you’ve got a surface-only scratch. We’ll assume that you’ve already washed the area thoroughly, rinsed it and dried it. Now you need to roughen the surface so that it will take the new paint or filler. Small scratches that have just taken off the top coat or so can be prepped with toothpaste – apply whatever’s in the bathroom cabinet to a soft damp cloth and buff away. Rinse thoroughly after you’ve enjoyed the nice minty smell and dry the area. If you’ve got a deeper scratch, use very fine sandpaper (2000 grit) to work gently over the area. Then wash and dry the area like heck to get all the dust away. Now the road divides. If you’re dealing with a more serious scratch that gets into the colour layer, the base coat or even (horrors!) the metal of the vehicle body, you need to go to the next paragraph. If you’ve got a small scratch, then just read on. With a small scratch, you get rubbing compound and wax from your local automotive supplies shop, apply a little bit of the rubbing compound and buff it like heck in small surfaces. If you’ve ever buffed a floor or your nails, you know how this is done. After this, apply wax and you should be all good. With a deeper scratch, you’re going to have to replace the coloured paint and possibly the primer below it as well. Here, you’ll have to spend a bit of time doing your homework, as you will need to get the right sort of paint or you will have an odd patchwork spot on your vehicle that looks worse than the scratch. If you know where to look on your car body (it varies from marque to marque), you can find the code number for the paint type. Try the door jamb, the glove box, in the bonnet by the VIN sticker, in the boot by the spare tyre, the owner’s manual… Yes, there are websites that have databases of the codes, but you have to be sure that you search on an Australian site (US and UK ones don’t have some Aussie favourites like the Ford Falcon). It also pays to know the name of your paint colour – there’s a lot more than 50 shades of grey out there… Do your homework, get that number and march down to the automotive supplies shop with it and ask for it (or you can try ordering it online). Use a scuffing pad to roughen up the surface immediately on and around the scratch so it will take new paint. Don’t do too wide an area. After brushing surface dust away (blow on it), apply the primer and let it dry. Once the primer has dried, it’s painting time. You can apply it with a brush, a pen or as a spray. A spray gives the nicest finish, but you’ll need to mask off things like headlights and bumpers. Let it dry for at least 15 minutes, then apply another layer. You may need to apply several layers until the scratch area looks like the undamaged paint around it. Finish off with a spray-on clear coat, then a good waxing after the clear coat has dried. 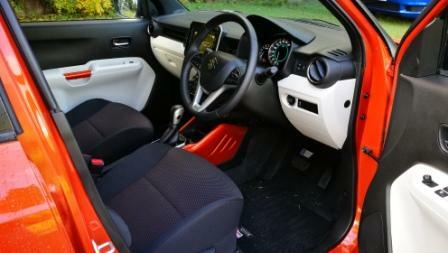 Wax the whole car while you’re at it so you don’t get funny looking patches of dull and shiny. 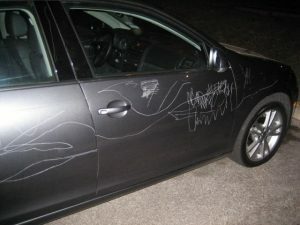 More extensive scratches, such as those inflicted by pillocks keying your car, may be better dealt with by a professional. It’ll certainly be less hassle.